We are so excited to show the recently completed full building renovation of the Maple Hill Funeral Home in Kansas City, KS. This renovation included revised layouts, new exterior windows and doors, new finishes, as well as a complete gut and remodel of existing restrooms. In addition, we also installed a new cremation machine in the building and all necessary electrical, structural, and roof modifications it required. 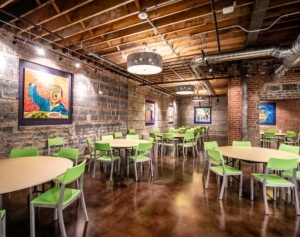 The meeting rooms, offices, and chapels showcase new flooring, wall coverings, ceilings, lights, doors and trim. 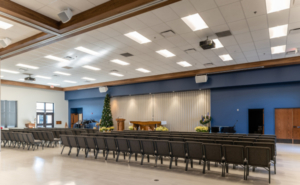 The main chapel also features an integrative lighting and wood panel system across the center of the room’s ceiling and down the center of the front of the room. The fully remodeled restrooms contain floor to ceiling tile, solid surface counters, and new ceilings. From start to finish, this project took five months to complete. Our project superintendent, Ralph Pruente, oversaw the entire process while self-performing a variety of smaller scopes. We were able to keep the staff operational throughout the process by phasing the work and even placing trailers for them to office out of for a few weeks. Getting to be part of this beautiful transformation of Maple Hill, along with the architects at H2B, has been extremely rewarding. Families dealing with circumstances that might be the hardest of their lives have a warm inviting and peaceful venue to come together as a family. We thank Maple Hill for allowing us to be part of there mission to serve families in their time of loss. 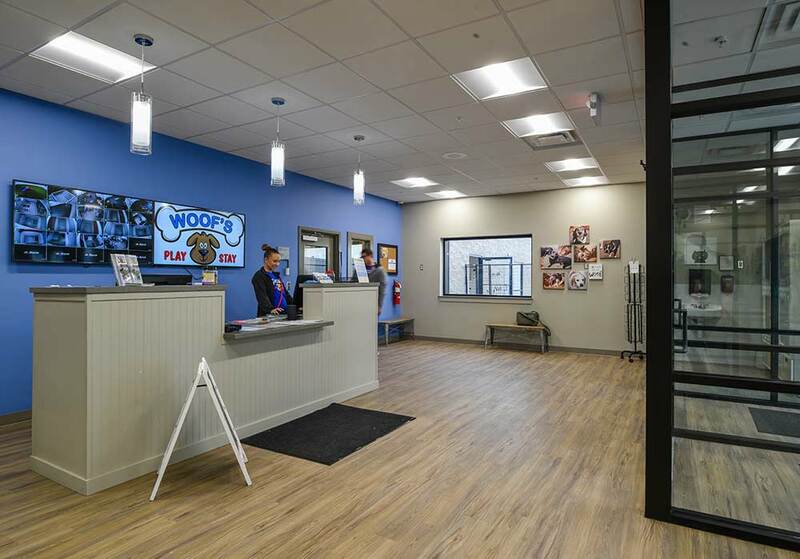 In February the Woof’s Stay & Play facility in Topeka Kansas opened its doors to many four-legged best friends throughout the Topeka area. 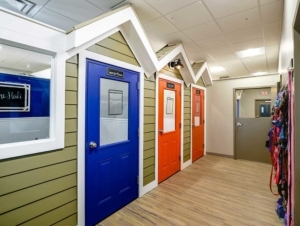 Woof’s Stay & Play is a business that believes in creating a home away from home for dogs. They also create peace of mind to the many dog parents who drop them off. Woof’s provides short term and long term stays for pets. The short-term stays are convenient for those who are just heading to work in the morning and need somewhere for their dog to have fun. The long-term stays are great for those who are heading out of town and can’t find a dog sitter. 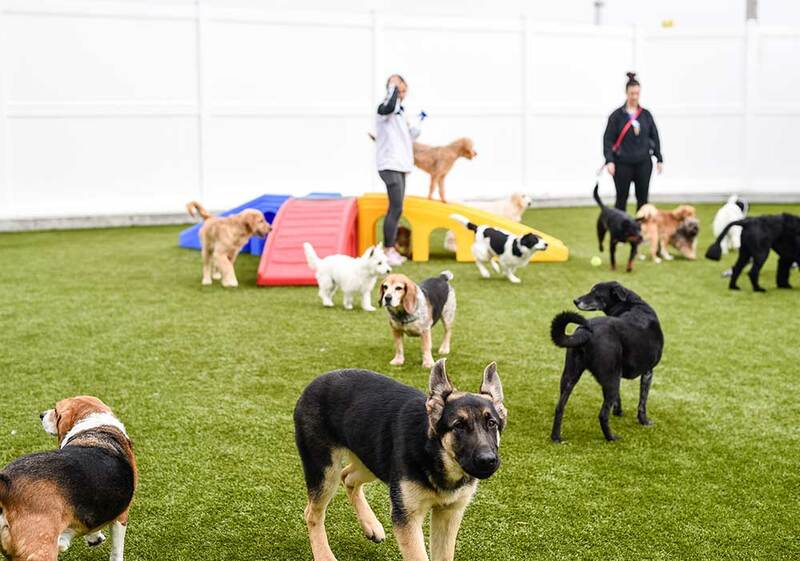 Throughout the days, the dogs can be found running around the outdoor space, being cleaned, and groomed. Also, when weather permits Woof’s will open the outdoor dog pool. 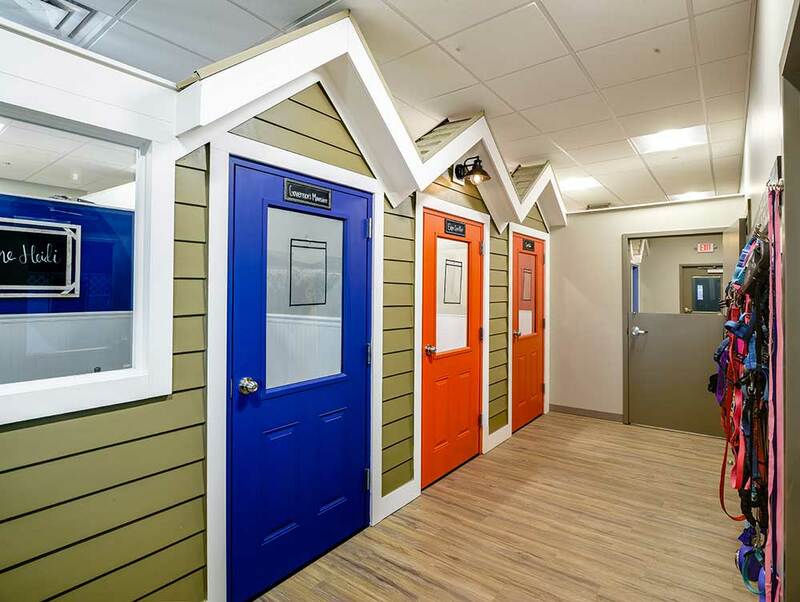 One of the things that is so popular about Woof’s is that all the pet community spaces are equipped with webcams. This allows the owners can check on them digitally throughout the day and have a sense of security. In the evenings, the pets are fed their dinner and put into their “suites” for the night. For those owners who have selected a “luxury suite” the dog can enjoy a more spacious stay, comfortable bed, small flat screen tv where they can enjoy a movie. The luxury suites are also equipped with webcams for the owner to have some peace of mind. 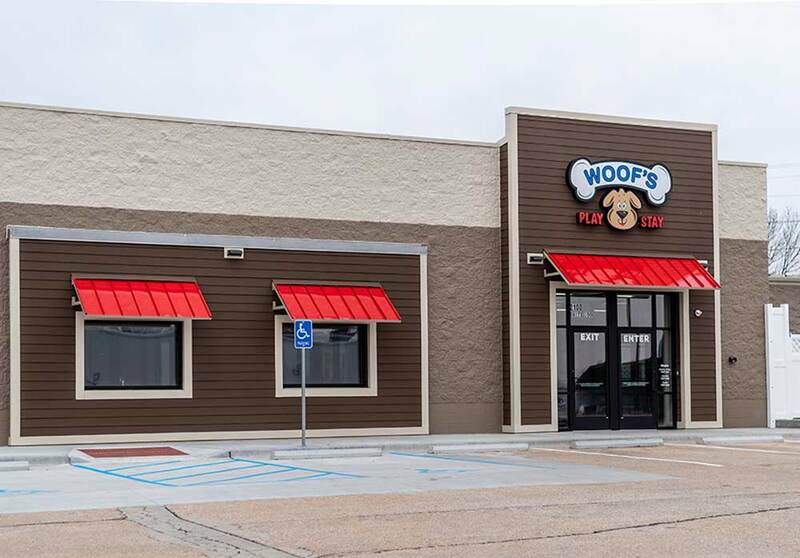 The Woof’s Stay & Play in Topeka is one of three Woof’s projects that Straub Construction has been hired to complete. Woof’s Lawrence is far into its construction and will be completed in the next few weeks. 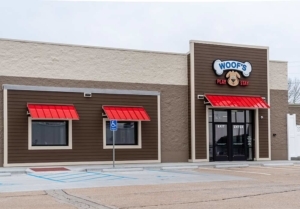 Woof’s Overland Park has just started and will be completed in about five months. All three of these projects have an extremely aggressive short construction schedule of about five months each. All three of the Woof’s locations were formerly businesses that are being renovated into state-of-the-art homes away from home for dogs. The Topeka location used to be a Sears Auto Center and the Lawrence location used to be a Half Price Books. The Overland Park location was a dog kennel which is remaining operational throughout the construction process. Through strong collaboration our team was able to overcome this complicated situation. These are extremely rewarding projects that impact dog lovers throughout their respective communities. We are very proud to be working with Woof’s Stay & Play on these projects. St. Charles Borromeo is a Catholic Parish and School located in Kansas City Missouri. The first St. Charles facility was built in 1949 and since then the parish/school has continued to grow. 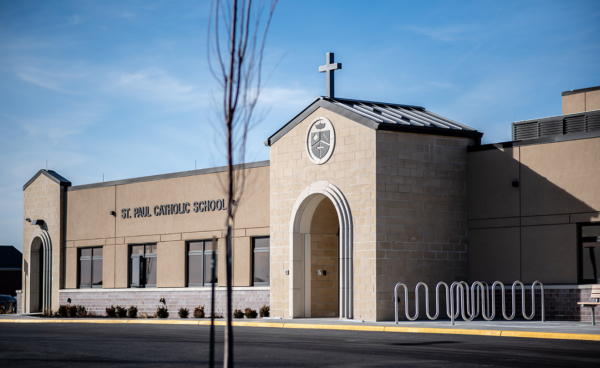 As the parish and school community has continued to grow, St. Charles had a need to expand. 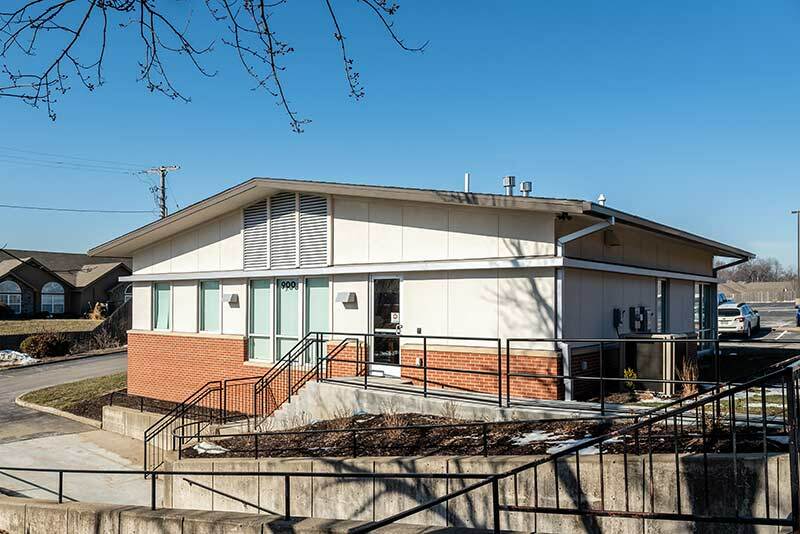 The parish wanted to move their administrative offices, add an elevator, and build a community gathering space. 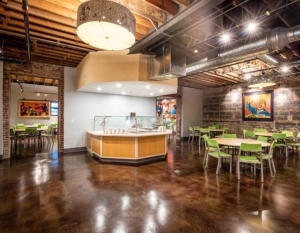 Straub Construction was selected to assist in the design and construct these spaces. Straub worked collaboratively with the St. Charles building committee Bill Browning and Jeff Hall of H2B Architects to create spaces that best fit the needs of the parish and school. Ernie Straub IV and Logan Stark lead this project as the project manager and superintendent. The narthex and community gathering space is a well-lit 1,265 SQFT open area which is connected to the entrance to the church. This space is vital to the church’s mission to “share our gifts as we minister through worship, faith, formation, education, and service”. The day that I was there, the space was filled with life and excitement, as the students assembled and decorated all their class donations for a local food drive. This beautiful open space allows for the parish and school to gather as a community and share their lives together. It includes a large walk out patio area that can also be used for outdoor events when the weather is nice. In addition to the gathering space, an elevator was added to the existing church building. The church and school host many events in the basement of the church. This new elevator was extremely important because it allows for the elderly and handicap of the St. Charles community to participate in these events. The parish office space is a 1,900 SQFT addition that houses six administrative offices, conferences rooms, and kitchen/lounge space. The school administrators were very excited to move from their over 60-year-old building to their bran new building. These state-of-the-art additions are facilities that the St. Charles Borromeo Parish family can be proud of. 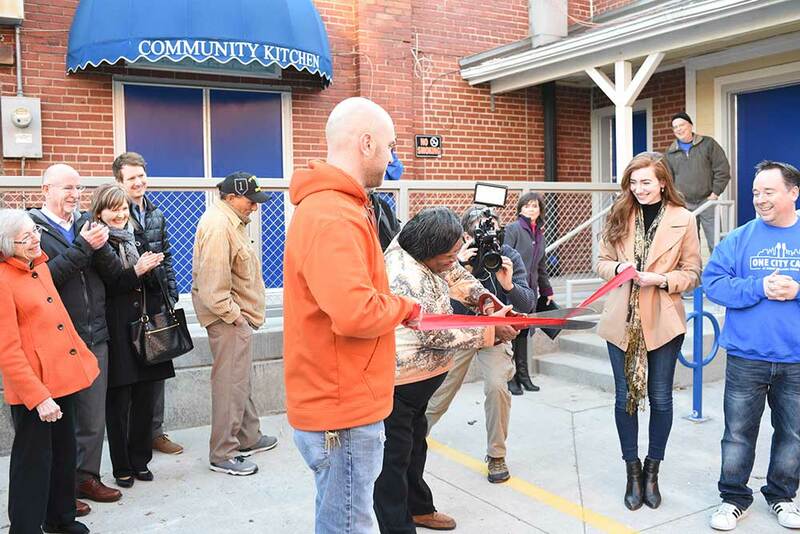 We hope that these new spaces will help to further the extremely important St. Charles mission. Shovel meets dirt. One of the most exciting times for any construction project, but the pomp and circumstance surrounding this landmark project wasn’t a typical event. The cold and wet conditions didn’t deter roughly 100 people from participating in the ground breaking for the Transient Barracks at the Mission Training Complex, Ft. Leavenworth, Kansas. The Dignitaries – More brass than an orchestra. 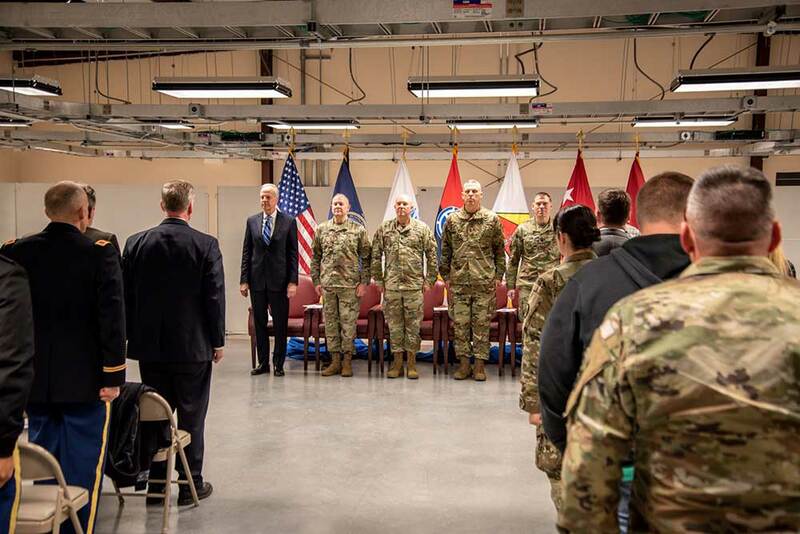 The distinguished official party included Senator Jerry Moran (KS), LTG Timothy J. Kadavy (Director, Army National Guard), MG Lee E. Tafanelli (Adjunct General, Kansas National Guard), MG Victor J. Braden (Commanding General, 35th Infantry Division) and LTC Kurt A. Rorvik (Commander, Mission Training Complex-Leavenworth). 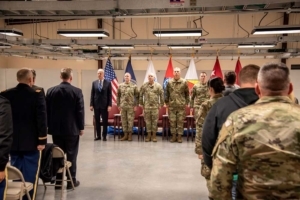 Every person spoke, describing the importance of this project to the State of Kansas, the Army National Guard and the 35th Infantry Division. Ft. Leavenworth is widely known as the Intellectual Center of the Army. 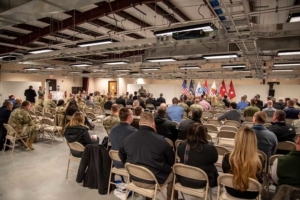 Annually, 12,500 people train at the Mission Training Complex and 35th Infantry Division Headquarters. 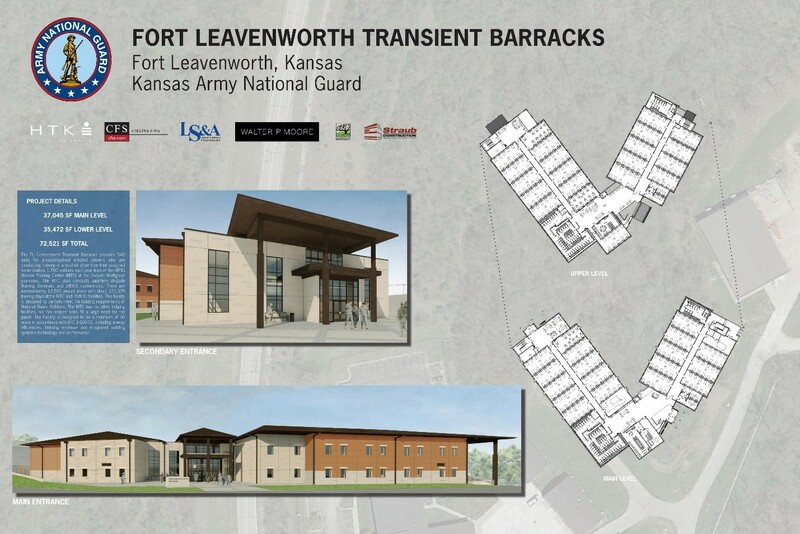 The barracks will provide 540 beds for unaccompanied soldiers who will participate in training exercises away from their home station. 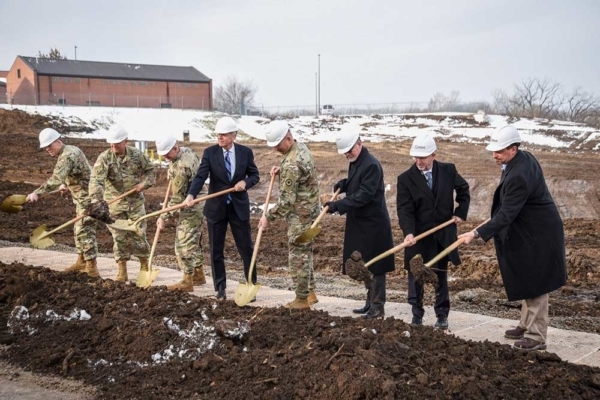 This facility will enhance National Guard readiness by improving the logistical issues and high costs of having the users staying in offsite hotels. The time and money saved will produce better, quality training. • Designed to be a minimum of 50 years in accordance with UFC 1-200-02, including energy efficiencies, building envelope and integrated building systems technology and performance. This is the 2nd project that we’ve worked on for the Kansas Army National Guard, having completed the Heartland Preparedness Center in Wichita, Kansas in 2014. It’s an honor to be able to do our part to support the brave men and women of the Kansas Army National Guard. Straub Construction is extremely excited to kick off a new project in Kansas City Missouri. 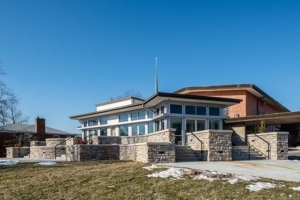 Due to the increasing need for affordable senior living in the Kansas City Area, the St. James United Methodist Church has decided to repurpose a piece of land that they own into a new senior living community. Over the past 5 years, the 40 Acres and a Mule Activity Campus, operated by the St. James United Methodist Church has been scarcely used to promote educational, recreational, prevention and intervention programs. As the metropolitan area continues to age, the church recognized and wanted to fill the need for quality and affordable senior living. The senior living community is named after Emanuel Cleaver II who represents Missouri’s 5th congressional district in the US House of Representatives, former mayor of Kansas City Missouri, and who served for many years as the pastor of the St. James United Methodist Church. The St. James United Methodist Church is currently lead by Emanuel’s oldest son Dr. Emanuel Cleaver III. The Emanuel Cleaver II Senior Living Community is located on 9 acres of land and will feature 52 townhouses and a clubhouse. The site will have a total of 18 buildings which are being built to LEED Sustainability Standards. This Senior Living Community will serve seniors over the age of 55. Straub Construction is partnering with St. James United Methodist Church (Owner), Clark Enersen Partners (Architect), and Dalmark Management Group (Developer) to build this project. The Emanuel Cleaver II Senior Living Community project will take approximately 12 months to complete. We’re very happy to kick off this new project in Kansas City Missouri. Now, let’s go move some dirt! S2 had the great opportunity to do a tenant improvement build out for the new Olathe Pregnancy Clinic (OPC) this summer. 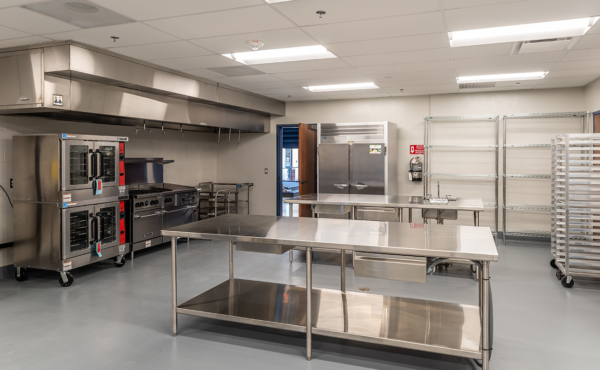 This project was in joint connection with our intern project and included a full demo and renovation of the front half of the space including new offices, counseling rooms, restrooms, and a sonogram room. Each of the areas received new flooring, ceiling tiles and grid, paint, doors, and lighting. The full scope of work was completed in less than two months! This was in large part due to our superintendent, Stephen LaGue, who was able to keep on schedule and on budget to get OPC in their new space as soon as possible. Stephen and I thoroughly enjoyed working with the people of OPC and Wyandotte Pregnancy Clinic and were honored to be a part of their team. Just over a month after project completion, the whole Straub team and a few of our subcontractors were invited to attend the clinics annual fundraiser. It was a great evening learning about their past and future projects and hearing their amazing impact from past clients. We were so happy to celebrate their successes and hope to work with them again in the future! 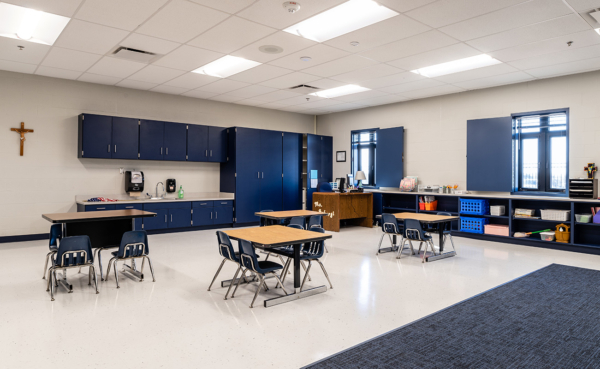 S2 had the opportunity to do a restroom renovation this summer at Sacred Heart of Jesus Catholic School in Shawnee, KS. 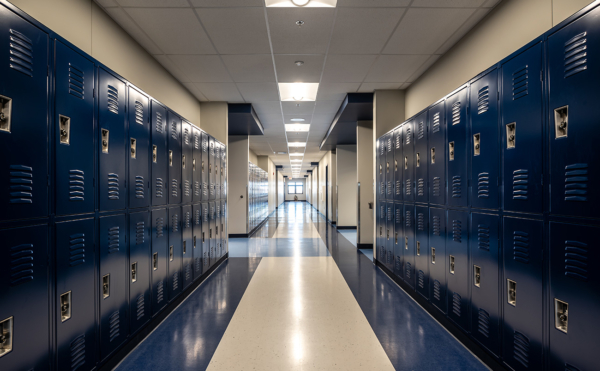 Both sets of main restrooms in the elementary and junior high areas were fully renovated in less than six weeks! 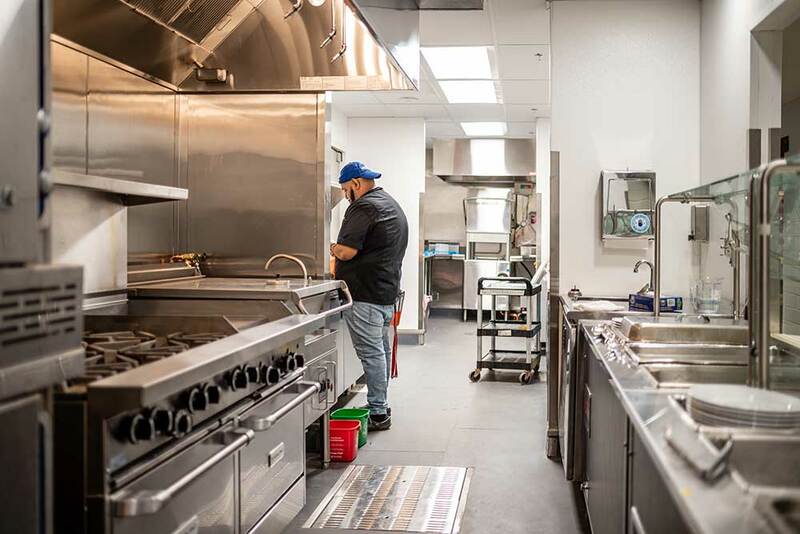 The renovation included new epoxy flooring, new floor to ceiling wall tile, new solid surface countertops, and larger mirrors in all four restrooms. Two of the restrooms also received new partitions. The wall tile and epoxy flooring gave the restrooms a more modern look and greatly increased the durability of the restrooms. Our superintendent, Jake Mclees, brought this project in ahead of schedule even with an already very tight schedule. He also self-performed a variety of scopes from hanging doors, installing partitions, and even final clean. We loved working with the school and we’re so happy they were able to start the school year with functional (and fancy!) new restrooms. Straub now has a certified drone pilot. Our first mission was St. Paul Catholic Church. A few months ago, I became certified through the FAA as a Remote Pilot. In order to fly a drone for commercial purposes, you must have, or be under, the direct supervision of someone with their remote pilot’s license. Receiving this license required numerous hours of study and passing a rigorous 60 question exam at an FAA facility. 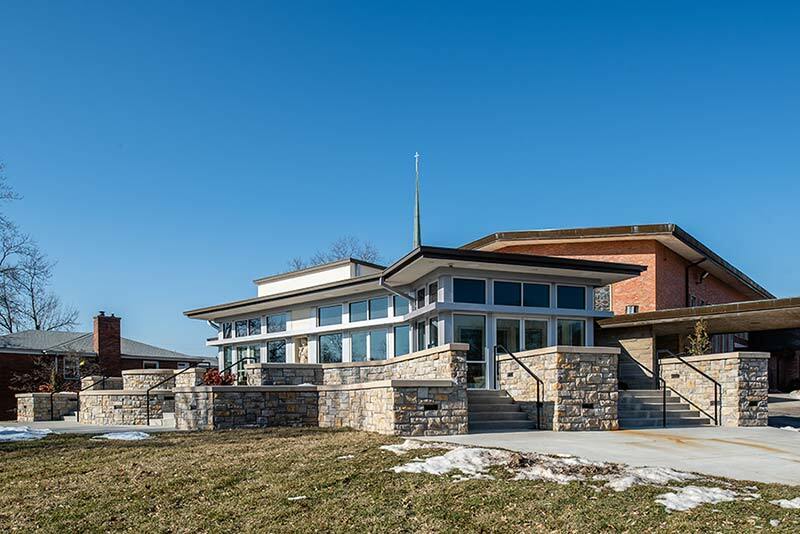 And now I’m excited to present my first drone video and project update for St. Paul’s Catholic Church in Olathe, Kansas. Yes, it was my first official mission! The St. Paul Catholic Church project is moving right along, on schedule. The project began in December of 2017 and is scheduled to be completed by early 2019. When the building is complete, the church and school will move all of their operations from their old facility into the brand-new building. A few weeks ago, all the teachers and staff took a tour of the new facility and they are all extremely ecstatic to move into their new building. 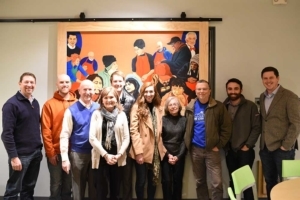 Straub Construction is happy to play a part in furthering their mission. 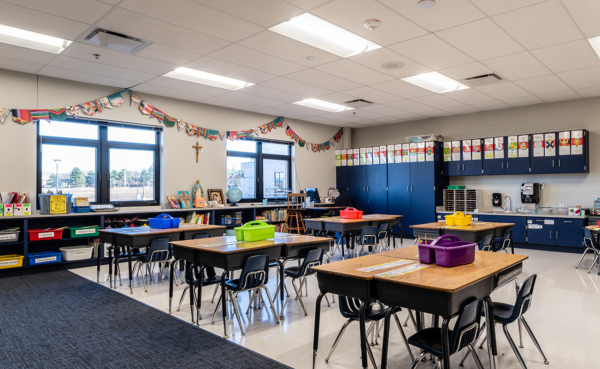 We’re excited for the future of St. Paul Catholic Church and School, and for the many generations of students, faculty, and parishioners who will benefit from this amazing project. 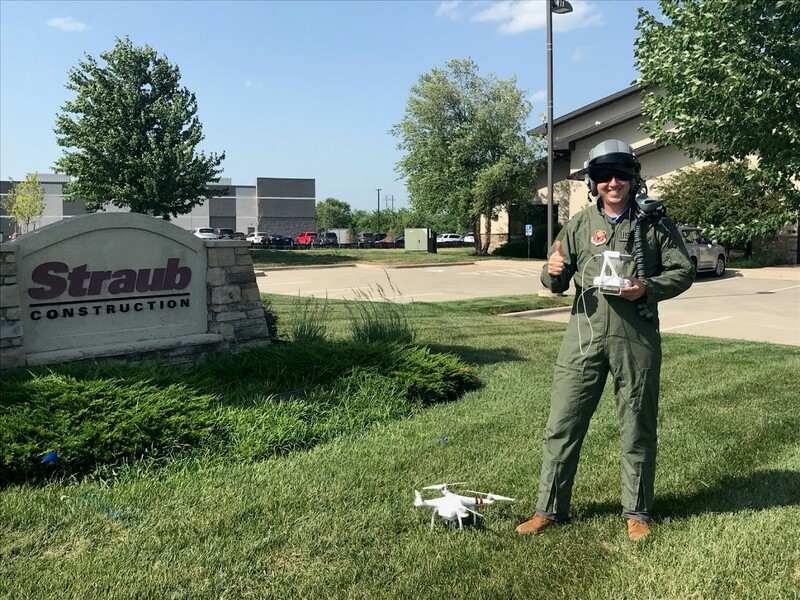 https://www.straubconstruction.com/wp-content/uploads/2018/09/Matthew-Full-Pilot-Gear.jpg 1073 1431 Matthew Straub http://www.straubconstruction.com/wp-content/uploads/2016/07/2016-Straub-logov2.png Matthew Straub2018-09-19 09:52:222019-03-20 09:47:11Straub now has a certified drone pilot. Our first mission was St. Paul Catholic Church.